Itching of the forehead skin, like elsewhere on the body, is mainly due to irritation, damage or disease in the affected area. It is a common problem for most people but usually an itchy forehead is a transient symptom. The itching occurs suddenly and resolves quickly with a little scratching or rubbing. However, there are instances where the itching persists and worsens over time. It may also be accompanied by a rash on the forehead or occur without any rash. There are many skin conditions that may present with itching, with or without a forehead rash. Itching on its own without other symptoms is often difficult to diagnose. The following skin conditions are among the more common causes of itching on the forehead. Allergic reactions may be the cause of itching on the forehead. It can occur as part of atopic dermatitis, which is commonly known as eczema. Atopic dermatitis usually starts in childhood and is associated with allergic rhinitis and asthma. The skin is dry, cracked, red and itchy. Another allergy-related condition is allergic contact dermatitis. It occurs when certain harmless substances (allergens) make contact with the skin. Allergic contact dermatitis only affect peoples with an immune hypersensitivity to the specific substance (allergy). Various substances can irritate the skin on the forehead. Scalp hair and hair care products are one of the major irritants of the forehead and is discussed in detail below. Other irritants may include soap, water, sweat, skin care products and various substances which may be found in the environment. Prolonged exposure to these otherwise harmless irritants can cause irritant contact dermatitis. 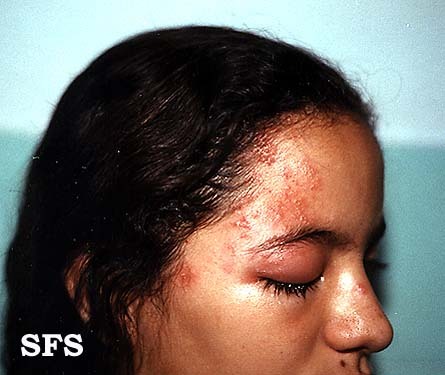 It is different from allergic contact dermatitis in that a person is not hypersensitive to the specific substance. Irritant contact dermatitis can affect anyone. Hair touching the forehead can irritate the skin over time. Unwashed hair laden with dust, dirt and accumulated hair styling products like styling gel is a common irritant. However, there may be much harsher substances that can be a major problem. Hair dyes, chemical straighteners and perm agents are some of the stronger substances that can lead to forehead itching. It may be an irritant or an allergen. Hair dye allergies are one such case. Hats, helmets, head scarves, veils and headbands are some of the headwear that can cause an itchy forehead. It may occur as part of irritant contact dermatitis, where the headwear irritates the skin directly. This may be related to the materials that the headwear is made of touching the skin or due to the pressure. The heat and sweat generated from covering the head can also act as irritants and thereby lead to itching. Rashes when present are often limited to the area that is in contact with the skin. 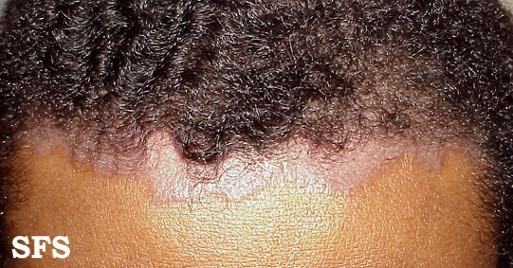 Forehead acne is common with facial and scalp acne. It mainly affects adolescents but can also occur in adulthood. Overactivity of the oil glands, inflammation and blockage of the follicles and bacterial infections are the reasons why pimples occur. Although pimples are considered to be the characteristic symptom, there are other symptoms even when pimples are not evident. Itching of the forehead may therefore occur in acne with or without the presence of pimples. 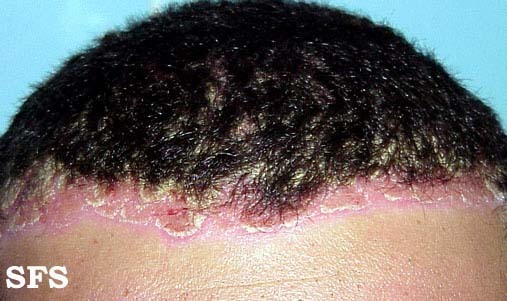 The forehead is just as prone for sunburn as any other exposed part of the body like the face and arms. Mild sunburn may not always present with the characteristic redness and swelling of the skin. Itching may be present on its own in very mild cases or may precede the skin redness. Eventually the skin peels. Sunburn does not only occur with the sun. Any source of UV light source can irritate and damage the skin, including tanning beds or booths. Wounds are usually painful and the pain can sometimes persist even after wound healing. The persisting symptoms depends on the extent of the injury and the treatment administered. Itching is a common symptom as a wound heals especially if it is covered with bandages, especially adhesive bandages or plasters. Sometimes itching does not arise from any skin problem and may be due to psychological factors. Anxiety and nervousness are common causes of itching although it is usually momentary. Some people may develop an itchy forehead as a nervous tic. This is habitual rather than pathological (due to some disease). These are pictures of some of the forehead skin rashes that may be itchy. The pictures below have been sourced from the Dermatology Atlas Brazil (atlasdermatologico.com.br). Medical treatment is needed for specific skin conditions once it has been diagnosed by a medical practitioner. The symptoms like itching will gradually ease and cease once the underlying condition resolves. However, there are simple ways to remedy the itching albeit temporarily without specific medical treatment. These remedies may not always be effective and it is always advisable that medical attention is sought. Rinse the forehead and scalp with cool water. Use only mild soaps if required and dry the area throughly but gently. Antibacterial and strongly perfumed soaps are a problem. Avoid using hair care products or even hair dryers too close to the forehead. Facial products that may be causing itching should be discontinued. Apply sunscreen liberally on the forehead and use a wide-brimmed hat if headwear is not contributing to the itching. Avoid sunlight if using certain prescription topical applications like those containing vitamin A derivatives. Stop using all headwear or change it for alternative materials if necessary. Helmets and hats that cannot be washed or replaced should not be used daily and the inside should be exposed to sunlight. Do not share personal items especially combs and hair brushes when fungal infections, scabies and head lice is a problem.